A small showcase of my personal projects and some tutorials that I find useful. The following code uses an ATTiny85 to turn a relay on and off based on a temperature reading from the LM34 temperature sensor. I used this to turn a freezer on and off to help save energy and to prevent the freezer from actually freezing anything. I don't have a wiring diagram or pictures to show as I no longer need this project. 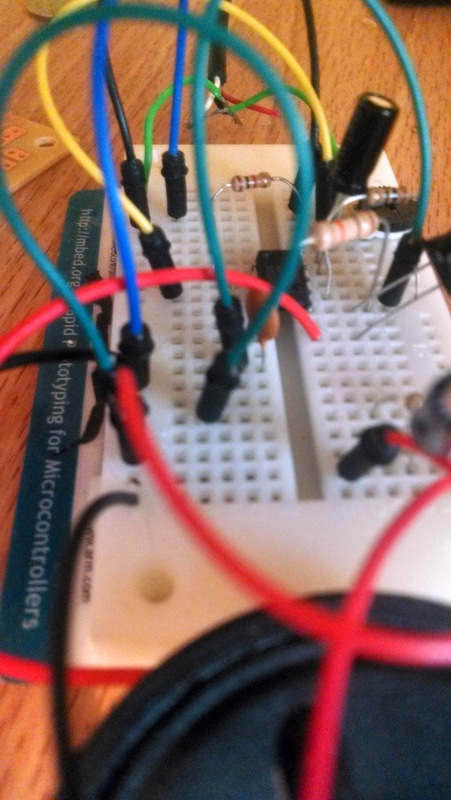 But this is a good example to show how to read an analog input into the ATTiny85 using the ADC. 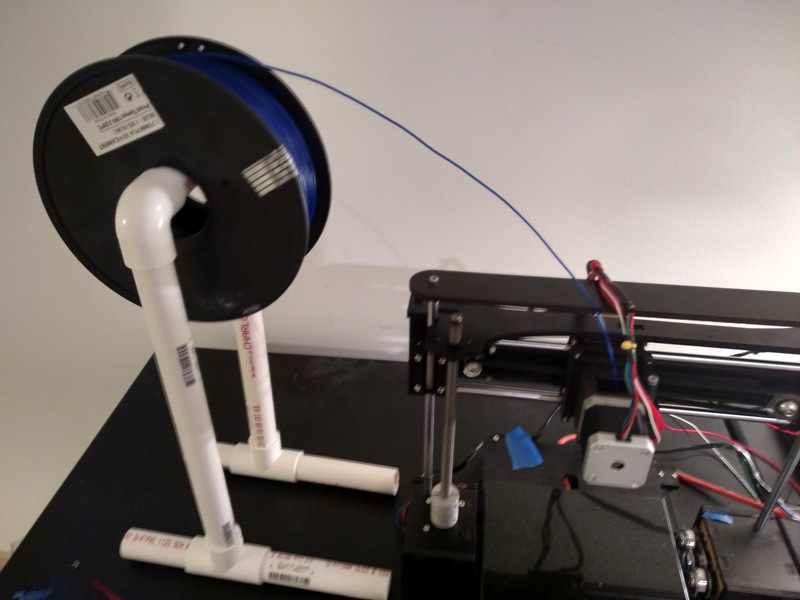 Last Sunday I got a 3D printer of my own! Here is a link where I will be uploading parts I create. I plan on designing parts for my own 3D printer (I have the QU-BD Two Up) and I thought it would be useful to others if I share it online. My next few posts will be about Atmel AVR programming. I've recently stopped using Arduino and decided to program AVR's strictly in C. In this post it's going to be about controlling the outputs on the AVR. This is very comparable to using digitialWrite(13, HIGH);. 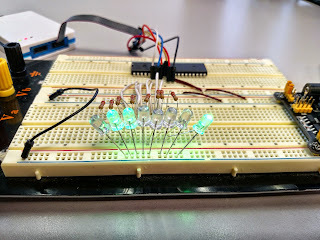 The mini project for this post is to make a string of LEDs light up in sequential order. What's really nice about using AVRs is that the code, for the most part, is portable to different types of AVR's. 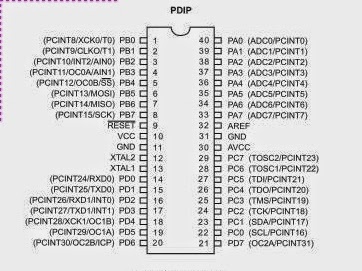 Take a look at the datasheet for the ATMega1284P so we can pick which port to use to hook the LEDs up to. On page 2 it shows the pinout for the AVR (I'm using a PDIP type). I'm going to use port B because they aren't separated and are on the same side of the chip which makes wiring a little bit easier. Now all we have left to connect is a power source and our programming cable. Looking at the pinout for the 1284, we need to hook up pin 10 to 5V, pin 11 to Ground, pin 6 to the MOSI of the programming cable, pin 7 to the MISO of the programming cable, pin 8 to the SCK of the programming cable, and pin 9 to the RESET of the programming cable. One thing that originally confused me when coming from Arduino to just AVR's was that you need an external power supply to power the chip. At least with the Atmel ICE, there is no built in power source, unlike on the Arduino. Both of these images are helpful for wiring up the programming cable. Now that everything is connected we can finally open up Atmel Studio and start programming! Create a new project from the start page when it first launches. Name it and save it wherever you want. The default location should be fine. Make sure that you're using a GCC C Executable File in the New Project wizard. Click Okay. Now select the chip you're using on the Device Selection window via the search bar or the list. I'm using the ATMega1284P so I selected that. You will then have a blank program ready for your input! The while loop inside of main is where our code will continuously run, it's very similar to how void loop() works on an Arduino. Inside of the main I set up the DDRB as an output register by setting each bit to 1. Inside of the while loop is where the whole port actually gets set high. By setting PORTB = 0xFF it sends a 1 to each bit in PORTB, which turns on every LED connected. In the example above we are only turning on 3 bits from the port, bits 1, 2, and 7. In the last example I'm going to show one more way of turning on individual bits, which is basically the same thing. In the example the goal is to have a single LED lit up moving up and down the port, it looks really cool. In the above example on line 17 and 22, the (1 << x) is basically saying to only set high the x bit. Meaning that if you typed PORTB = (1 << 3), the 3rd bit (PB3) would be the only bit set high on that port. We're also going to talk about how to use the IDE briefly, just so you can follow along better. These three tasks are relatively simple, but understanding these will let you control thousands of other devices, not just LEDs! To create a new sketch, all you do is open up the IDE, which can be downloaded at Arduino.cc. Once opened there should be nothing except for an empty area. Every Arduino program needs two functions to compile. Those functions are void setup() and void loop(). Those can be seen in the picture below. 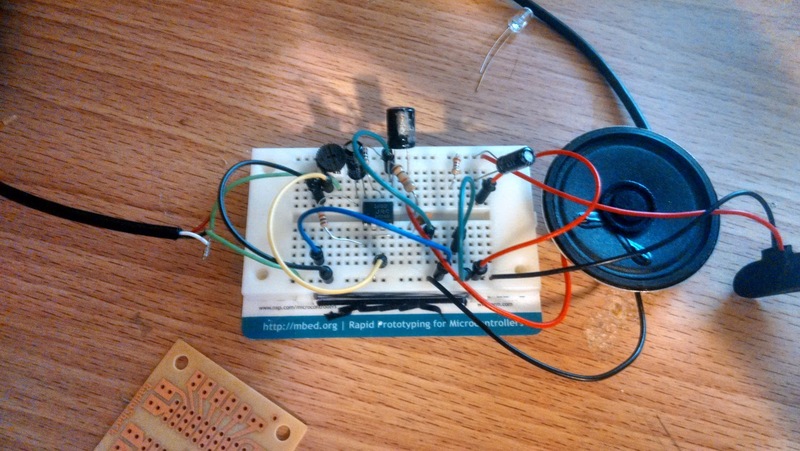 The setup() function only runs once on the Arduino. It's often used to set pin modes as either inputs or outputs, and can be used to initialize variables at startup. The loop() function runs forever, until your board loses power, or you program a stopping point. It runs very very fast, and a majority of your code goes in here. Now I want to explain what the pinMode() command does. pinMode() tells the Arduino what to set each pin as, either an input or output. pinMode has two parameters. The first parameter tells the Arduino which pin you're talking to, and the second parameter defines it as an input or output. Look at the picture below to see it being used. The pinMode() is also usually found in the setup() function. The Arduino would pause what it was doing for 500 milliseconds and keep doing the command above it until the 500 milliseconds has passed. Another incredibly useful command would be analogWrite(). analogWrite() lets your vary the brightness of an LED or the speed of a motor. It uses something called pulse width modulation which does exactly what the name is. It varies the width of the HIGH LOW transitions to make it appear the voltage is changing, when in reality we're only changing the time that the pin is HIGH or LOW really fast. The parameters for analogWrite are the pin number, and a value between 0-255. 255 is a duty cycle of 100%, 127 would be 50%, and 0 would be 0%. It is very important to use a pin on the Arduino that is compatible with PWM. Look up the specs for your Arduino and use one of the pins that is useable with PWM. The reason we use a 10 millisecond delay in the LED fading is so it doesn't happen so fast, and it looks better to the eyes! In the for loop I have a counter 'i'. It starts at 0, and every 10 milliseconds it increments by 1 (that's what the i++ does). It then writes the value of 'i' to the second parameter of analogWrite and the LED then shows that brightness. Once the first for loop is completed, it moves on to the second one, which is just the opposite. It starts the LED off at full brightness, and brings it back down. Another really cool and important topic is the use of variables. Variables make code much more readable and easier to debug when you're having problems. All you need to do is create a variable, set a value to it, and use it in your program instead of hardcoding in the pin numbers. An example is below. Notice how I removed the '3' in the analogWrite functions and replaced them with led. It makes the program look a little bit nicer I think. Thanks everyone for reading! Next time we'll go over input devices, like switches, potentiometers, and LDR's (light dependent resistors). 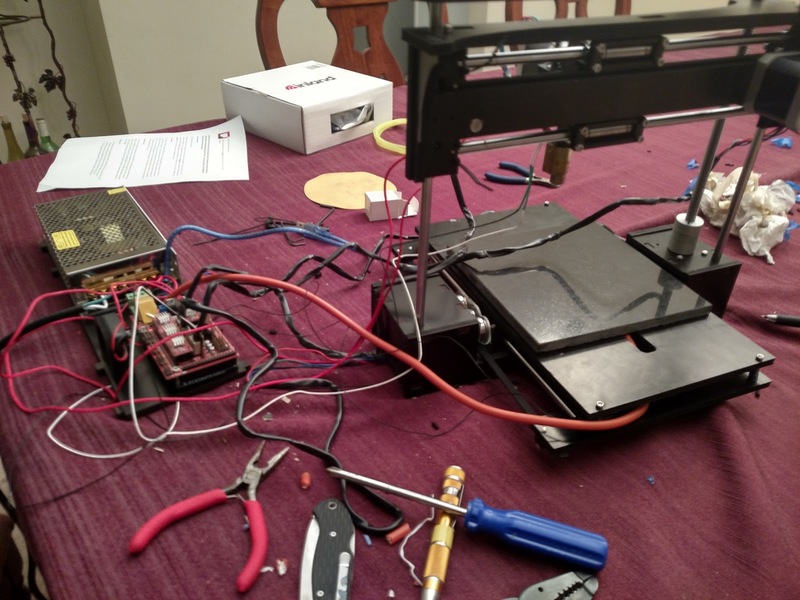 This post isn't really anything Arduino related, but still a really cool project. 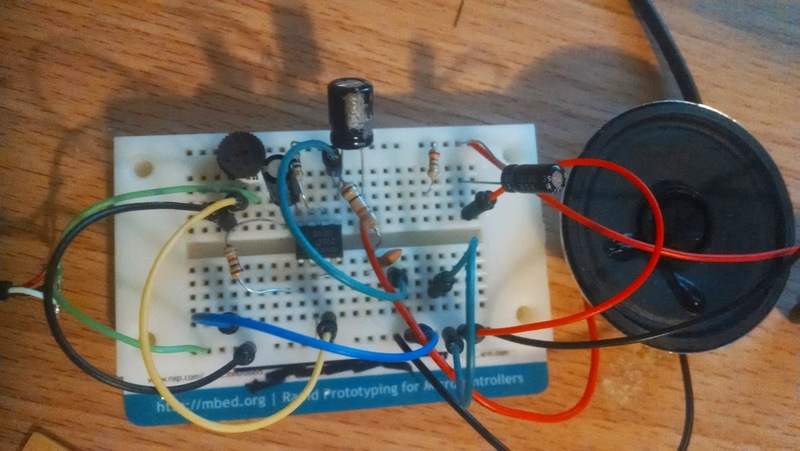 I created an audio amplifier that you can connect to your iPod or whatever else you play music with and listen to it on a speaker. 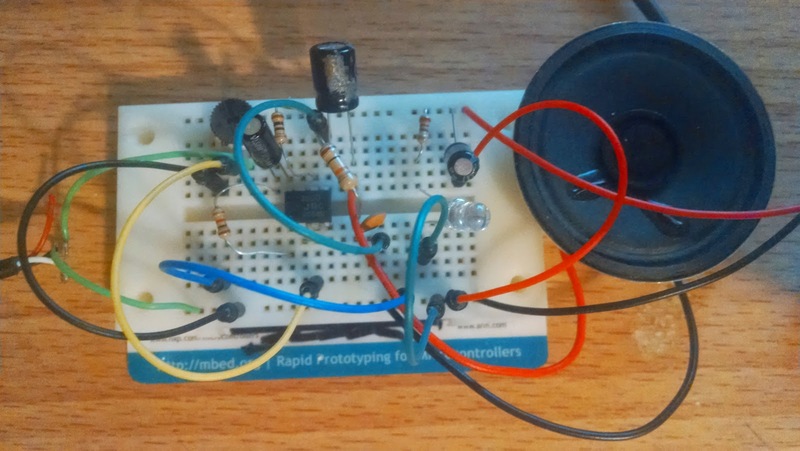 In it's current state it's mono, but by adding a second speaker and second operational amplifier you can easily turn this into a stereo sound system. The schematic for this is pretty simple, and fun to make. I think it's kinda nice making something that doesn't involve programming or micro controllers. I created the schematic using Eagle. You can change the gain by adding a capacitor between pins 1 and 8. You can make the gain variable if you put a resistor in series with it. You can see that I did this at labels C1 and R1. I would reccomend you add a potentiometer instead of the resistor R1 so you can change the gain on the spot. If you don't put anything between pins 1 and 8, the built in 1.35K ohm resistor would set a gain of 20dB. Capacitor C2 is used to help reduce noise to the speaker. It helps to remove constant DC voltage and only allows the audio waves to pass through. 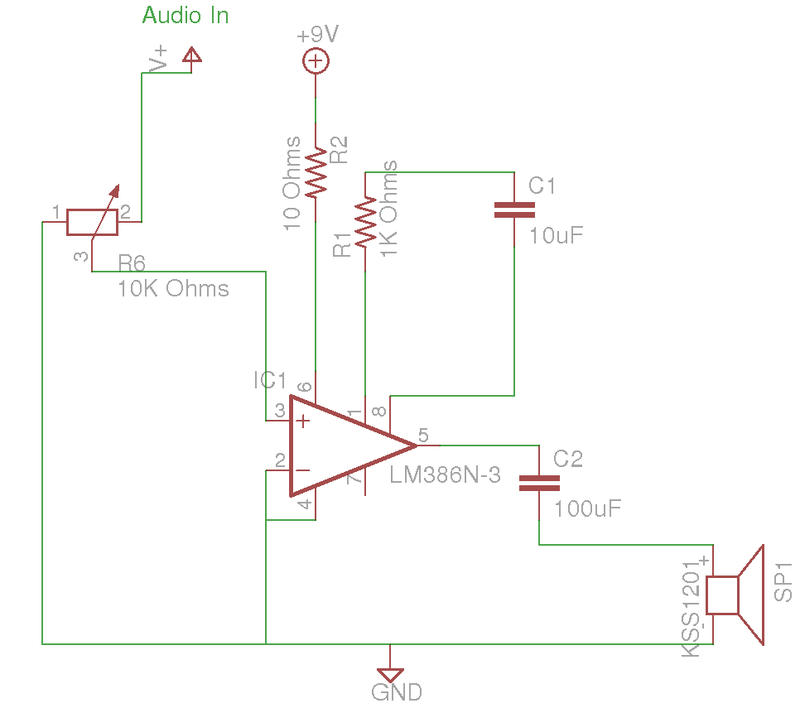 If you wanted to make this stereo, you would need to repeat the circuit to be the same, except you would share the potentiometer that controls the gain between the two, and connect their grounds together. Inside of an audio cable there are 3 wires. Black for Ground, and the two other colors are for each audio channel. Connect one channel to one of the OP AMPS, and the other channel to the second one. The next step is to solder this onto perfboard and put it in a nice enclosure. 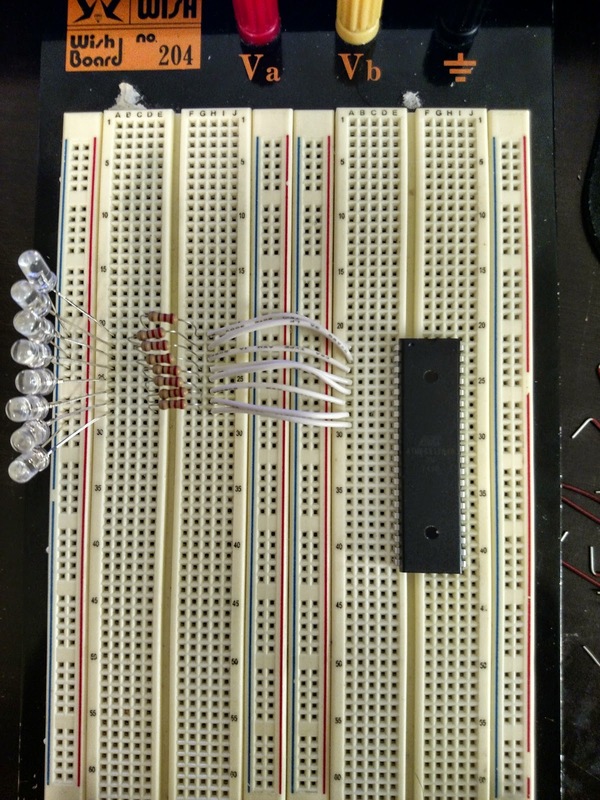 Here are some pictures of the one I made breadboarded up. 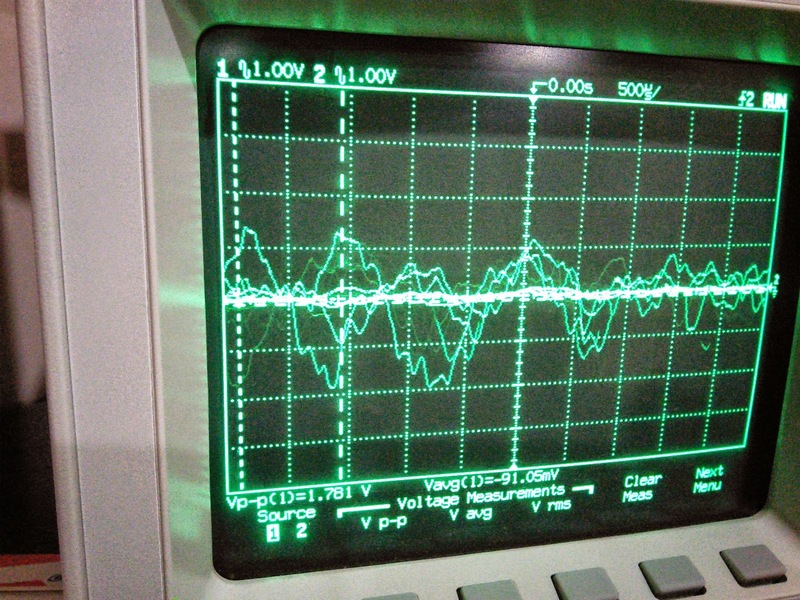 Now here's some pictures of it being used with an oscilloscope so you can actually see the gain. It's hard to see the original signal a little bit but it's the bright small wave in the very center. 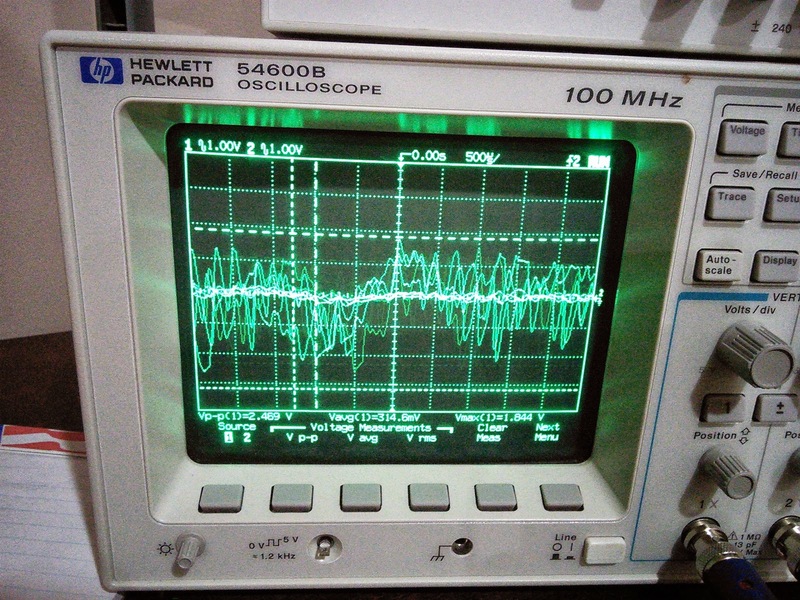 The outside wave is actually the smaller signal amplified. Looks like it's amplifying very well! The gain might be set a little too high though, you can see in some spots how instead of a nice sinusoidal wave we get flatness at the top. That's because it's amplifying too much and is exceeding the OP AMPS power limits. This could be solved by using a 12 volt battery or greater compared to our 9 volt battery. And here's just another view. I hope you guys enjoyed this little project! My next couple of posts are going to be Intro to Arduino tutorials that I'm going to use for a school club I'm teaching. Those should be done fairly soon!